Not The Barnet Times: Top Barnet Tory Suspended! Dr Richard Evans, deputy head of Copland Community College, has been suspended by Brent Council over allegations of illegal bonus payments. Head teacher Sir Alan Davies and bursar Columbus Udokoro have also been suspended. According to the London Evening Standard, Auditors are investigating £1 million paid in bonuses over seven years. 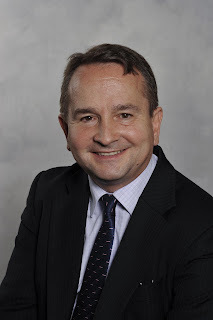 Dr Evans stood as the Conservative Parliamentary Candidate for Hendon at the General Elections in 2001 and 2005 where he lost on both occasions to Andrew Dismore. It is rumoured that he quit Hendon Conservative Association after failing to be selected to fight the seat for a third time. Conservative Home website recently had Dr Evans at number 4 on their list of people David Cameron should consider appointing to the House of Lords when the Conservatives return to power. No charges have yet been brought against Dr Evans, but if any allegations against him are proven, it is hard to imagine that he will be offered a seat in the Upper House. There is, of course, nothing wrong in paying bonuses to teachers who excel at their jobs provided that such payments are above board and properly authorised. Not The Barnet Times hopes that any allegations made against Dr Evans and his colleagues prove to be unfounded. No chance. When the full details emerge the only thing left for you to do will be to examine why you are such a poor judge of character. Others saw this coming.. Your words would appear to be from someone in the know. If others could “see this coming” (assuming wrongdoing is proven), why did they not speak out sooner? Turning a blind eye is not a particularly attractive trait.